Ecology is the study of organisms, populations, and communities as they relate to one another and interact in the ecosystems they comprise. In ecology, ecosystems are composed of organisms, the communities they comprise, and the non-living aspects of their environment. The four main levels of study in ecology are the organism, population, community, and ecosystem. Ecosystem processes are those that sustain and regulate the environment. Ecological areas of study include topics ranging from the interactions and adaptations of organisms within an ecosystem to the abiotic processes that drive the development of those ecosystems. Ecology is the study of the interactions of living organisms with their environment. Within the discipline of ecology, researchers work at four specific levels, sometimes discretely and sometimes with overlap. These levels are organism, population, community, and ecosystem. 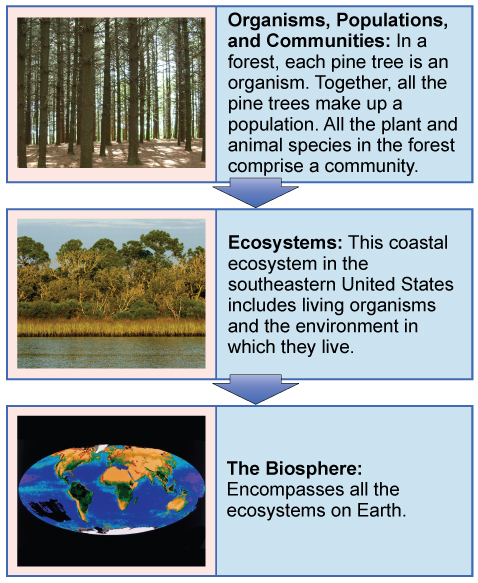 In ecology, ecosystems are composed of dynamically-interacting parts, which include organisms, the communities they comprise, and the non-living (abiotic) components of their environment. Ecosystem processes, such as primary production, pedogenesis (the formation of soil), nutrient cycling, and various niche construction activities, regulate the flux of energy and matter through an environment. These processes are sustained by organisms with specific life-history traits. The variety of organisms, called biodiversity, which refer to the differing species, genes, and ecosystems, enhances certain ecosystem services. Levels of ecological study: Ecologists study within several biological levels of organization, which include organism, population, community, and ecosystem. There are many practical applications of ecology in conservation biology, wetland management, natural resource management (agroecology, agriculture, forestry, agroforestry, fisheries), city planning (urban ecology), community health, economics, basic and applied science, and human social interaction (human ecology). Organisms and resources comprise ecosystems which, in turn, maintain biophysical feedback mechanisms that moderate processes acting on living (biotic) and nonliving (abiotic) components of the planet. Ecosystems sustain life-supporting functions and produce natural capital, such as biomass production (food, fuel, fiber and medicine), the regulation of climate, global biogeochemical cycles, water filtration, soil formation, erosion control, flood protection, and many other natural features of scientific, historical, economic, or intrinsic value. There are also many subcategories of ecology, such as ecosystem ecology, animal ecology, and plant ecology, which look at the differences and similarities of various plants in various climates and habitats. In addition, physiological ecology, or ecophysiology, studies the responses of the individual organism to the environment, while population ecology looks at the similarities and dissimilarities of populations and how they replace each other over time. Finally, it is important to note that ecology is not synonymous with environment, environmentalism, natural history, or environmental science. It is also different from, though closely related to, the studies of evolutionary biology, genetics, and ethology. Organismal and population ecology study the adaptations that allow organisms to live in a habitat and organisms’ relationships to one another. Organismal ecology focuses on the morphological, physiological, and behavioral adaptations that let an organism survive in a specific habitat. Population ecology studies the number of individuals in an area, as well as how and why their population size changes over time. The Karner blue butterfly, an endangered species, makes a good model for both organismal and population ecology since it is dependent, as a population, on a specific plant that grows within specific areas, which, thus, influences butterfly distribution and numbers. Karner blue butterfly: The Karner blue butterfly (Lycaeides melissa samuelis) is a rare butterfly that lives only in open areas with few trees or shrubs, such as pine barrens and oak savannas. It can only lay its eggs on lupine plants. Researchers studying ecology at the organismal level are interested in the adaptations that enable individuals to live in specific habitats. These adaptations can be morphological (pertaining to the study of form or structure), physiological, and behavioral. For instance, the Karner blue butterfly (Lycaeides melissa samuelis) is considered a specialist because the females preferentially oviposit (that is, lay eggs) on wild lupine. This preferential adaptation means that the Karner blue butterfly is highly dependent on the presence of wild lupine plants for its continued survival. 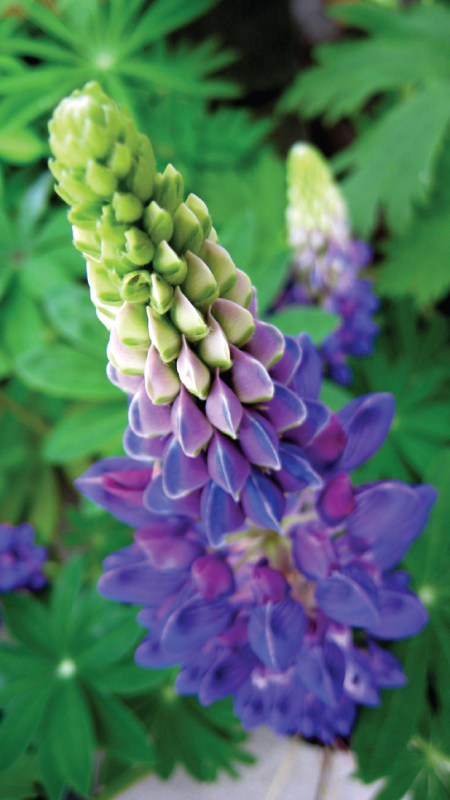 Wild lupine: The wild lupine (Lupinus perennis) is the host plant for the Karner blue butterfly. After hatching, the larval caterpillars emerge to spend four to six weeks feeding solely on wild lupine. The caterpillars pupate (undergo metamorphosis), emerging as butterflies after about four weeks. The adult butterflies feed on the nectar of flowers of wild lupine and other plant species. A researcher interested in studying Karner blue butterflies at the organismal level might, in addition to asking questions about egg laying, ask questions about the butterflies’ preferred temperature (a physiological question) or the behavior of the caterpillars when they are at different larval stages (a behavioral question). A population is a group of interbreeding organisms that are members of the same species living in the same area at the same time. Organisms that are all members of the same species, a population, are called conspecifics. A population is identified, in part, by where it lives; its area of population may have natural or artificial boundaries. Natural boundaries might be rivers, mountains, or deserts, while examples of artificial boundaries include mowed grass or manmade structures such as roads. The study of population ecology focuses on the number of individuals in an area and how and why population size changes over time. 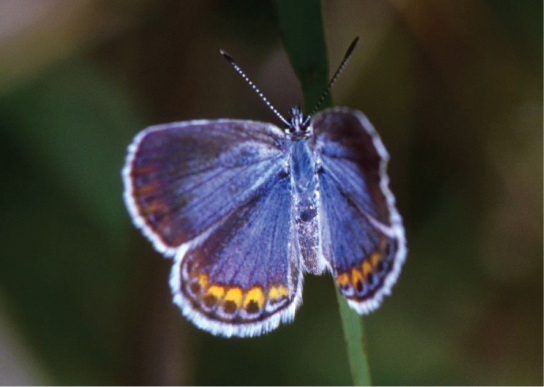 Population ecologists are particularly interested in counting the Karner blue butterfly, for example, because it is classified as federally endangered. However, the distribution and density of this species is highly influenced by the distribution and abundance of wild lupine. Researchers might ask questions about the factors leading to the decline of wild lupine and how these affect Karner blue butterflies. For example, ecologists know that wild lupine thrives in open areas where trees and shrubs are largely absent. In natural settings, intermittent wildfires regularly remove trees and shrubs, helping to maintain the open areas that wild lupine requires. Mathematical models can be used to understand how wildfire suppression by humans has led to the decline of this important plant for the Karner blue butterfly. Community ecology studies interactions between different species; abiotic and biotic factors affect these on an ecosystem level. Community ecology focuses on the processes driving interactions between differing species and their overall consequences. Ecosystem ecology studies all organismal, population, and community components of an area, as well as the non-living counterparts. The mutualistic relationship between the Karner blue butterfly and ants are of interest to community ecology studies since both species interact within an area and affect each other’s survival rate; in turn, they are both affected by nutrient -poor soils, which are part of the ecosystem ecology. For example, the larvae of the Karner blue butterfly form mutualistic relationships with ants. Mutualism is a form of a long-term relationship that has coevolved between two species and from which each species benefits. For mutualism to exist between individual organisms, each species must receive some benefit from the other as a consequence of the relationship. Researchers have shown that there is an increase in the probability of survival when Karner blue butterfly larvae (caterpillars) are tended by ants. This might be because the larvae spend less time in each life stage when tended by ants, which provides an advantage for the larvae. Meanwhile, the Karner blue butterfly larvae secrete a carbohydrate-rich substance that is an important energy source for the ants. Both the Karner blue larvae and the ants benefit from their interaction. Karner blue butterfly caterpillar: Karner blue butterfly caterpillars form beneficial interactions with ants. This mutualistic relationship is an example of a community ecological study, which aims to examine the interactions between different species living in an area. Ecosystem ecology is an extension of organismal, population, and community ecology. The ecosystem is composed of all the biotic components (living things) in an area along with that area’s abiotic components (non-living things). Some of the abiotic components include air, water, and soil. Ecosystem biologists ask questions about how nutrients and energy are stored, along with how they move among organisms and the surrounding atmosphere, soil, and water.